Even though bleach brightens whites and helps remove stains, it contains toxic chemicals that can cause discoloration and damage to a wide array of fabrics, including polyester. An excessive amount of bleach as well as improper use can damage the polyester fabric beyond repair. 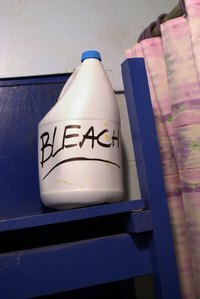 Several inexpensive and common bleach alternatives will whiten and deodorize polyester safely. Baking soda is an all-natural white powder that contains sodium borate. It is commonly used in recipes and as an all-purpose cleaner and deodorizer. Baking soda also helps whiten whites without causing damage and discoloration to fabrics such as polyester. To use baking soda, add 1 cup of the inexpensive powder for each load of laundry washed. Not only is borax a common ingredient in green cleaners, it will also boost your laundry detergent's cleaning power and brighten your white fabrics. In addition, borax does not contain toxic chemicals and will not pollute your home or your environment. A ratio of 1 cup of borax per load of laundry will keep your clothing clean. Alternatively, soak the polyester in a mixture of 1 gallon of water and 1 cup of borax for 30 minutes before laundering as you normally would. Even though it is safer and less damaging to fabrics than bleach, hydrogen peroxide does not lack stain-removing power and will eliminate bloodstains from white clothing safely. When using hydrogen peroxide as a bleach alternative, choose 3 percent hydrogen peroxide. This peroxide is available in the health and beauty section of grocery stores. Replace bleach with 1 cup of 3 percent hydrogen peroxide for every load of laundry. For a prewash stain treatment, apply hydrogen peroxide directly to the bloodstain and wait 15 minutes before rinsing with cool water. Containing hundreds of oxygenated bubbles, oxygen bleach cleans and whitens in the same manner as chlorine bleach without the damaging side effects. Since oxygen bleach contains sodium percarbonate, it does not produce harmful fumes as chlorine bleach does. To use oxygen bleach on polyester, add 1/2 cup of the powder for small loads and one full cup for larger loads.